I love brunch. It's a fun reason to get friends or family together to share some quality time and good food. Is it breakfast? Lunch? Whatever you're in the mood for is the right choice. 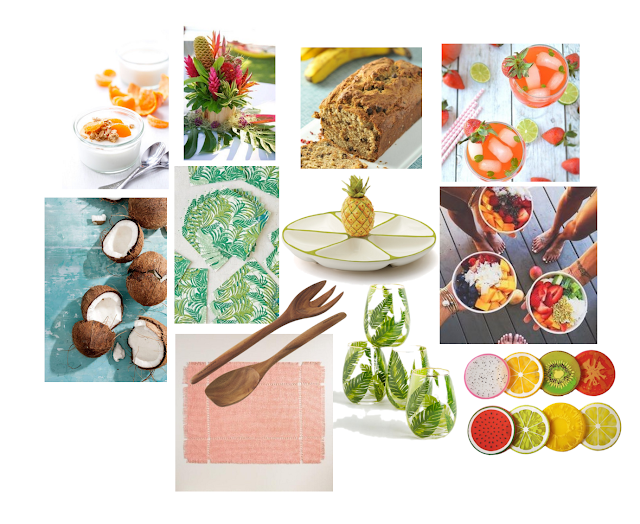 Now that the weather is warm, I'm dreaming of all things tropical-inspired, and this is my how-to for a colorful, fun get-together. For something that's not too formal, I often turn to Paperless Post for their whimsical and pretty designs. 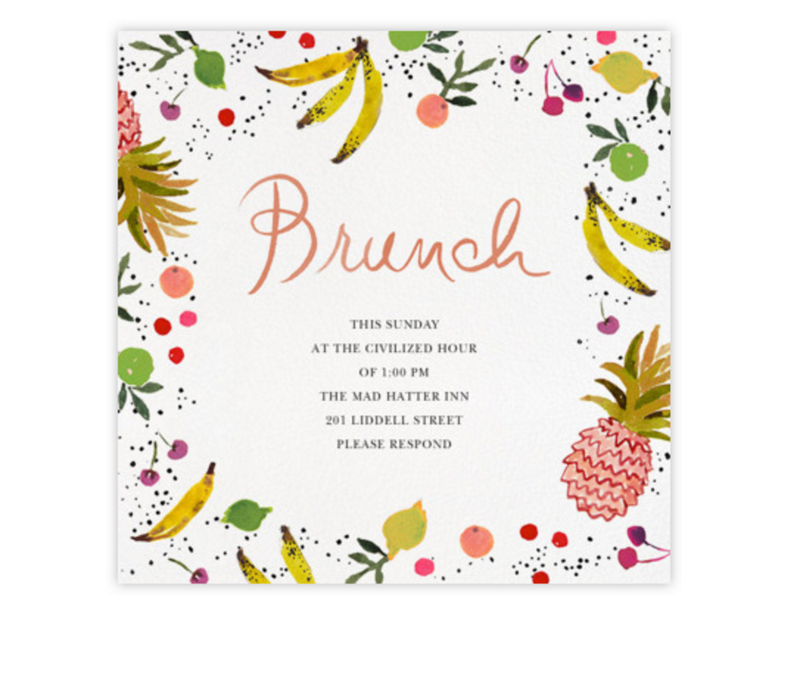 This one is my favorite brunch invite! Next, I always create an inspiration board or pin a few things to my Party Inspiration board on Pinterest. You can always tell when I've got a particular theme I'm working on, as the pins all seem to go together. This helps me to get some cohesion and organization when it comes to putting colors, recipes, and decor together to create a particular experience. It's easy to get overwhelmed by all the content on Pinterest, so limit your search to specific items, and have a few ideas in mind before you begin scrolling. It is so important to have a set of go-to entertaining pieces in your home. 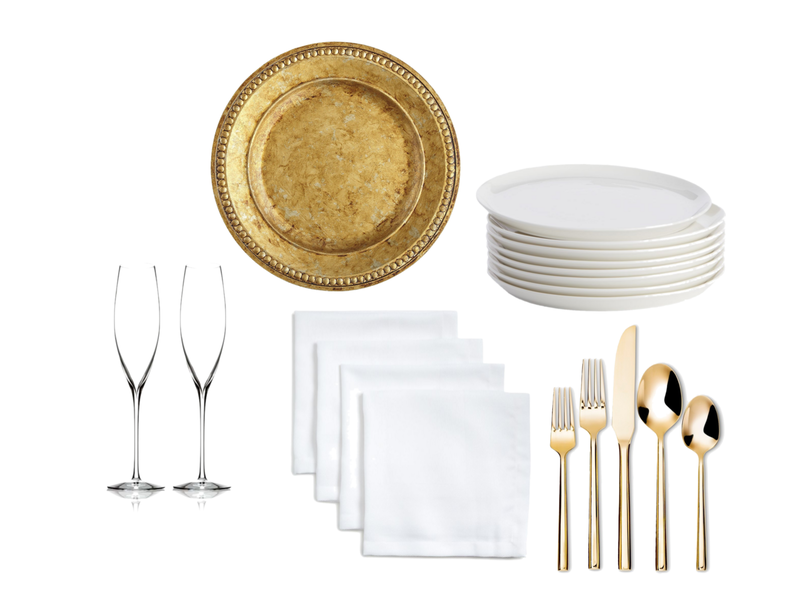 To avoid purchasing a completely new dining set each time I host a party, I always begin every tablescape with white dinner plates, and I often use gold chargers and gold flatware. Most prints, colors, and decorative pieces can be added to this to create just about any kind of look. For a themed event, it can be fun to pick up a specialty dish like this one, pretty napkins, or a fun set of glassware. Next, you'll want to choose your recipes and make a list of things you'll need to pick up at the store. 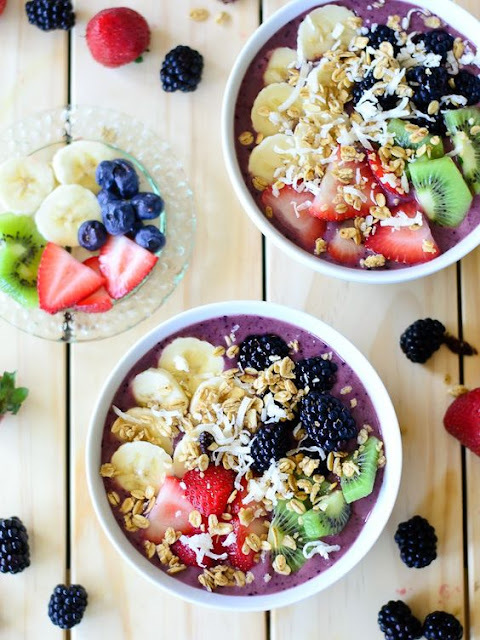 One of my personal favorites for brunch is a flavorful and colorful acai bowl. Kids and adults alike enjoy crafting their own combinations to create something sweet and healthy! I would suggest setting up a bar station with all kinds of toppings like coconut flakes, chia seeds, granola, fresh fruit, berries, and honey. Here's an easy recipe for creating your bowls! In addition to acai bowls, I'd serve fresh fruit juices, a mixed kale and strawberry salad (for those who are feeling more inclined toward lunch food), and have a loaf of banana bread sliced on a wooden serving board. Yum! When I'm hosting a brunch or party of any kind, my go-to hostess look is a pretty dress, jumpsuit/romper, or pair of printed pants. I'm all about being comfortable! The last thing you want to be thinking about is fussing with some sort of tricky outfit or piece that won't stay put as you entertain. I love this dress and the print is so on trend and perfect for a tropical brunch! This jumpsuit would also be pretty, playful, and ultra comfortable! Remember, whatever happens, make sure you are able to enjoy the moments celebrating with friends and family. Instead of being stuck in the kitchen, fussing over the tiniest of details, or worrying if your guests are having fun, decide to relax and enjoy the conversations, laughter, and time together. The best parties and get-togethers aren't the most perfect, they are always the ones that are filled with fun and celebration! Cheers! Thanks, Liz!! Glad you liked it! The print on those pants is so pretty! I love brunch- thanks for the ideas and inspiration! I really liked some of the tips and ideas you’ve mentioned in this post and it’s nice to see that you’ve shared some amazing recipes too. These will be useful for me, as I’m looking for some interesting ideas for the food and decorations for my birthday party this weekend, which I’m arranging at the venue NYC.